The state is aware that free press means more accountability and their fear of being monitored, exposed, or held accountable indicates how fragile and insecure they are. Protest in front of journalists' syndicate in Cairo on 2 January 2017. NurPhoto/SIPA USA/PA Images. All rights reserved. “Listen only to me” - Even if he had tried, Egyptian President Abdel Fattah El Sisi could not have described his authoritarian military reign better. Exactly one year since he demanded the people not believe the “enemies of the nation”, the margin for freedom of speech and expression has progressively shrunk to absurd levels. On 17 March 2017, government sponsored candidate Abdel-Mohsen Salama became the head of the journalists' syndicate. Salama is the managing editor of state owned Al-Ahram newspaper, and at the top of his list of supporters is former National Security officer Ahmed Mousa, a notorious mouthpiece for the regime who was supposedly intentionally planted in Al-Ahram. This recent development forecasts even darker times for an already gloomy era. The militarization of politics as well as authoritarianism are suffocating the people of Egypt. Public spaces are slowly but surely being securitized as the media is coopted. The economy is being divided like a pie to a select few, as a number of business tycoons and regime loyalists strategically buy out firms and distribute them among military men and their associates. Falling in line with this clampdown, assets of Mostafa Sakr, owner of Daily News Egypt, Egypt's only English independent daily print newspaper, and Arabic financial newspaper Al Borsa, were frozen. Sakr has been accused of belonging to the Muslim Brotherhood terrorist organization. Although handed out abundantly, the accusation was even more ridiculous this time, as the regime had previously used the newspaper to seek out investors for its mega projects. It seems hypocritical, to say the least, to then accuse the owner of the very same newspaper of being affiliated with the Muslim Brotherhood. “President Sisi to Daily News Egypt” read the front page of an August 2014 issue. The freeze order coincided with parliament passing a media "regulations" bill, which gives the government total control over both state and private owned media outlets. The new law stipulates the formation of three regulatory bodies to oversee all of Egypt’s media outlets, be it public or private. Heads of these bodies are appointed by none other than the president himself, according to Article 32. “The new law opens the door for the executive authority to dominate media,” Yehia El Qallash, ex-head of the Press Syndicate, told me. The state is refraining from building trust, he added, asserting that the current situation does not champion freedom of expression, and that of the press. However, Qallash has more to worry about than the new law. Qallash informed me that the syndicate had presented the Amnesties Council with a list of 29 imprisoned journalists, and 18 other journalists not imprisoned but under threat. Qallash is one of those 18 individuals under threat as well as the head of the syndicate’s Freedoms Committee, Khaled El Balshy. Never has the syndicate head been tried and handed an imprisonment sentence in its 75 year history. 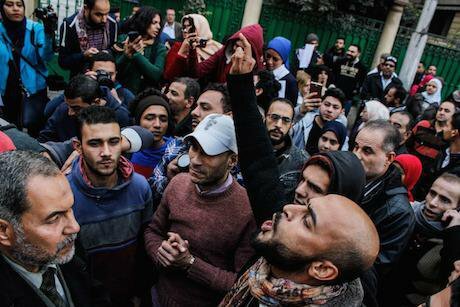 Never has the syndicate HQ been stormed before, but both catastrophes took place under the Sisi regime. Qallash and El Balshy are accused of “harboring fugitives”, namely journalists Amr Badr (also editor-in-chief of Bawabet Yanayer) and Mahmoud Al Sakka. Both journalists were arrested the night the syndicate headquarters were attacked in May 2016. They had been outspoken against the selling of the two Red Sea Islands to Saudi Arabia, and skeptical about official narratives of the murder of Giulio Regeni, pointing fingers at the state. “Authorities were also bothered by the website’s coverage,” Badr said, disclosing that during the investigation, the journalists were questioned about the stories they had published. They were put behind bars over stating their opinions, adding to their 63 jailed colleagues. “Freedom of expression in Egypt is a big zero,” Badr believes. Disbelief clouded those in the profession, as journalists were banned from attending the funeral held for the victims of a recent church explosion, considered one of the biggest terror attacks during Sisi’s reign of power. The journalists were kept in a separate room, and were handed official photographs on their way out. Openly expressing dissent with policies in Egypt, the contracts of correspondent AlBaraa Abdullah and TV anchor Lilian Dawood with OnTV were both terminated after the channel was acquired by pro-state businessman Abu Hashima. Abu Hashima now also owns Al Youm Al Sabe’, Ain, and Sawt Al Omma newspapers, as well as the Dot Masr online website. One only has to take a look at these outlet’s amateur headlines to know what kind of messages they are conveying. Sisi’s loyal clan deny the obvious militarization of Egypt and it will be interesting to see their justification for the appointment of former military spokesman Mohammed Samir as head of Al-Asema TV Channel. The internet is no exception to the state’s control attempts. While the digital age provides massive room for freedom of expression, the Egyptian State is going out of its way to curb this space. Using its ‘digital armies’ and paid social media trolls, it floods the internet with messages that influence the less informed, threatening opposition, and constructing an illusion of a public opinion supportive of the state. As the state took away more human rights, it shunned its criticizers in the name of economic and security stability. But as the value of the Egyptian Pound sinks lower, it has become harder to mute critical voices. Prices have increased, while wages remain stagnant. The economic crisis has started biting the middle class as it depletes the poor. Although militant attacks in northern Sinai have not ceased, with an Egyptian general assassinated in October, the church explosion exposed the security apparatus. In the following months, the situation crumbled until hundreds of Copts fled Al-Arish City, fearing increased threats, killings, and attacks by militants. Security is why Sisi came to power, and its laxity at a time of economic turmoil is threatening his supremacy day by day. With every decision the government makes, the volume of criticism gets louder, and the state grows more paranoid. The state is aware that free press means more accountability and their fear of being monitored, exposed, or held accountable indicates how fragile and insecure they are. “Dictatorships fear the truth,” El Balshy told me, narrating how the media had a big role in exposing toppled President Hosni Mubarak’s regime, and overturning Mohamed Morsi’s. Between killing and imprisoning journalists, a syndicate report stated that more than 782 violations were carried out in 2015 alone. The Committee to Protect Journalists named Egypt the third country in the world with the highest number of jailed journalists in 2016. The sad truth remains that if you are not a government mouthpiece, you are in danger. While the state punishes journalists for doing their job, many behind bars are being granted international awards, including Ismail Alexandrani and Mahmoud Shawkan. Until these shackles are broken, those holding dearly to the essence of their profession will have to continue shouting “journalism is not a crime”.